Ultimately, this is an unfussy burger that's meant to be enjoyed, not analyzed. Hours: Tues–Thu. 11 a.m.–10:30 p.m., Fri. 11 a.m.–midnight, Sat. 10 a.m.–midnight, Sun. 10 a.m.–10:30 p.m.
KronnerBurger isn't the first Bay Area pop-up to make the jump to the brick-and-mortar world, but few such leaps have been more highly anticipated. By now you may have heard the general gist of the story: Chris Kronner, who had successful stints at such acclaimed San Francisco restaurants as Slow Club and Bar Tartine, left upscale California cuisine behind and started slinging burgers at bars and in alleyways. The so-called Kronnerburger was a hit, and Kronner started making plans for a restaurant — an updated version of a classic diner that would have enough space for him to buy whole steers and to dry-age and grind the beef for his burgers in-house. But I hope the mural controversy won't keep you away. In recent years, hamburgers have become something of a cult object among some food nerds. I, too, have pored over modernist recipes that call for strands of freshly ground dry-aged beef to be arranged into meticulous parallel rows, or for the patties to be first cooked very slowly in a low-temperature water bath before they hit the grill. And I've waited in line and paid the requisite $15 (or whatever) to eat several such burgers in their natural habitat. Kronner Burger: A Burger for the End of Civilization from Bert Johnson on Vimeo. Here in the Bay Area, the Kronnerburger is the latest version to be named best of the best, and one way to understand why is to geek out over its technical merits. 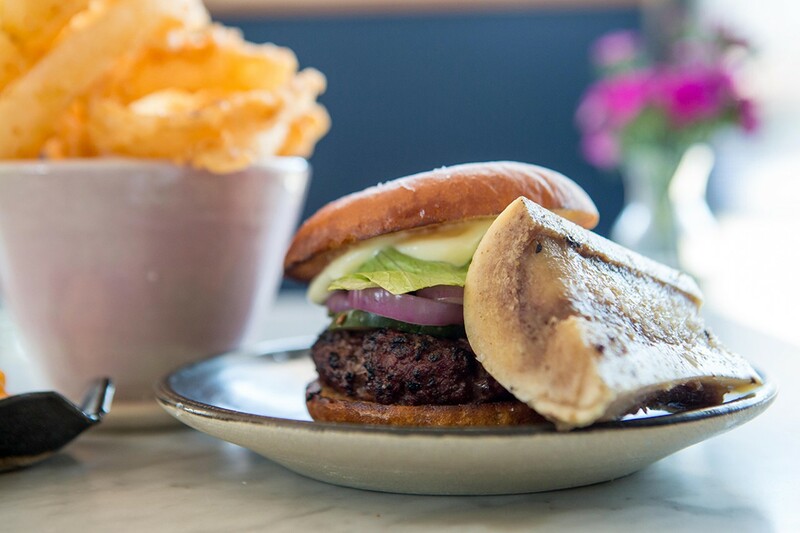 There's the specificity of each beef patty: Half of the meat is dry-aged and comes from very lean, retired dairy cows; the other half comes from grassfed steers that Kronner buys whole, almost every part of which (except the steak cuts) goes through the grinder. The restaurant makes its own pain de mie-style potato buns, which have a potato flour element that adds a subtle sweetness. And cheddar cheese gets blended into the mayonnaise that serves as the burger's only condiment, making the salty richness of a cheeseburger a built-in feature. Kronner is fond of saying that his place is more than "just some burger joint." But at the same time it is a burger joint, and having now tried the Kronnerburger a couple of times, I can say that what I loved best was that it's an unfussy burger that's meant to be enjoyed rather than analyzed. The meat is grilled hot and fast over a live fire to achieve Kronner's personal ideal: a juicy burger that's very rare and very salty — though not so salty as to detract from the deep, earthy beefiness that blooms in your mouth. The garnishes don't mess with the perfect simplicity of a fast-food burger — pickles, grilled onions, and crisp iceberg lettuce. The cheese-spiked mayo soaks richness into every bite, and if you're a true hedonist you'll order the optional side of roasted bone marrow, too. Spoon those soft nubs onto your bun or, to hell with it, just drizzle the pure liquid gold directly onto the patty — it's enough decadence to imagine that this is how those ancient Greek or Roman ruling classes must have rolled. If such excesses speak to the decline of our civilization, well, I'm content to go down with a Kronnerburger in each hand. In short, this is no restaurant for diners who want to exercise restraint. 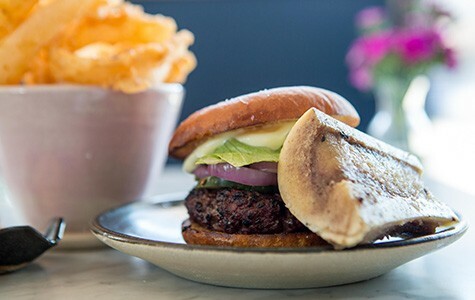 In that sense it's good that the burger patty clocks in at a relatively modest five ounces; otherwise, you'd be left with little stomach space for the rest of the menu. The fries, for instance, are the pinnacle of the genre — airy textural perfection. (They don't come included with the burger, but one $4 side order is portioned for two burger eaters to share.) Same goes for the onion rings, which have a paprika-tinged rice-flour batter and arrived at our table greaseless and enduringly crisp. Among the burger variants that rotate through the lunch and dinner menus, the most spectacular was the Mangalitsa Pigburger, a grease-soaked, "three-napkin" sandwich that puts the fatty heritage pig breed to good use: a crisp-edged sausage patty of sorts topped with an Alabama-style white barbecue sauce, which was essentially a vinegary mayonnaise made by emulsifying rendered pork fat. Gilding the lily, underneath the patty was what turned out to be pickled pig skin — just one more layer of fatty, jiggly deliciousness. There's also a mushroom-based, vegan "Earth Burger," and an option for a house-made vegan burger bun or one that's gluten-free. But as Kronner says, the restaurant serves more than just burgers. Up and down the menu, Kronner has reinvented diner standards with flair, but also an understanding of what makes the originals so beloved. Chicken wings kept their crunch by virtue of being drizzled with, rather than drenched in, hot sauce, and Kronner's play on a traditional Buffalo-style wing sauce — loaded, as it was, with fermented chilies and chicken fat (in place of the butter) — packed enough of a punch that you didn't need much. The restaurant has the most compelling beer, wine, and cocktail list I've ever seen at any upscale diner, but the vanilla-specked housemade orange cream soda was so refreshing, I'd be hard-pressed to ever order anything else as long as it's available. Desserts, too, played with the diner theme to wonderful effect: A fudgy chocolate peanut butter malt pie had a graham cracker crust with just enough of a salt hit to appeal to grown-ups as well as kids. Nothing on the menu was outlandishly priced — not even in the daily specials section of the menu, which topped out with a $22 steak frites dish. That said, it's probably best to treat most of the daily specials as shareable appetizers rather than full-on entrées. The best of was a take on the Tuscan bread salad known as a panzanella. Ours featured no bread at all (though that may have been an oversight), but instead big chunks of potato, cucumber slices, sweet bits of crisp chicken skin, and addictively smoky chicken meat pulled from whole birds that get roasted over the coal beds left under the grill at the end of dinner service. Weekend brunch is a whole other regime of decadence: poached eggs and slices of slow-cooked pork over buttermilk biscuits; cheesy baked grits that were, like so many dishes, studded with pork fat; and custardy peach bread pudding. If there was any disappointment, it was that I missed the free-form, improvised quality that marked the food from Kronner's non-burger pop-up days, when the limitations of having to use a single induction burner stretched the chef's creativity and cooking chops to their limits — when the menu might have entirely different theme for any given week. I asked Kronner if he thought the whole "updated diner" concept ever felt too restrictive, as though he were locked into recreating the kinds of dishes you'd find at a Fifties-style roadside dive — elevated versions, yes, but a bunch of fried food at the end of the day. Kronner said he didn't think that was the case. And the truth is, there wasn't anything remotely diner-like — in inspiration or actual substance — about a salad of stone fruits, radishes, and the thick-tendriled edible weed known as purslane that started one of my meals at KronnerBurger, or the aforementioned panzanella for that matter. And even as this review was being written, Kronner told me that he'd already gotten in a shipment of rabbits and quail, and that a whole goat wasn't far off. If all these years of perpetual pop-up-dom have taught him anything, it's how to be nimble and adaptable, Kronner said. I, for one, am looking forward to seeing what other tricks he has up his sleeves.